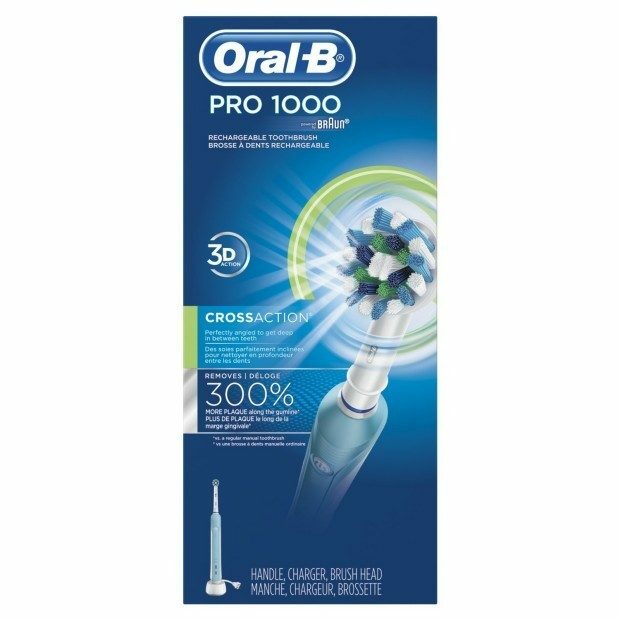 Oral-B PRO 1000 Electric Rechargeable Power Toothbrush Just $55.97! You are here: Home / Great Deals / Amazon Deals / Oral-B PRO 1000 Electric Rechargeable Power Toothbrush Just $55.97! Over 2,000 positive reviews on this #1 Best Seller in Rechargeable Toothbrushes! Head over to Amazon and order the Oral-B PRO 1000 Electric Rechargeable Power Toothbrush Just $55.97! This item qualifies for FREE shipping! The Oral-B Deep Sweep 1000 provides a clinically proven superior clean vs. a regular manual toothbrush. The Deep Sweep brush head features three bristles zones to reach deep to remove plaque, and 3D cleaning action sweeps side to side and pulsates to break up and remove up to 100% more plaque than a regular manual toothbrush. The pressure sensor lights up if you brush too hard to prevent harmful over-brushing and there is an in-handle timer to help you brush for a dentist-recommended 2 minutes!